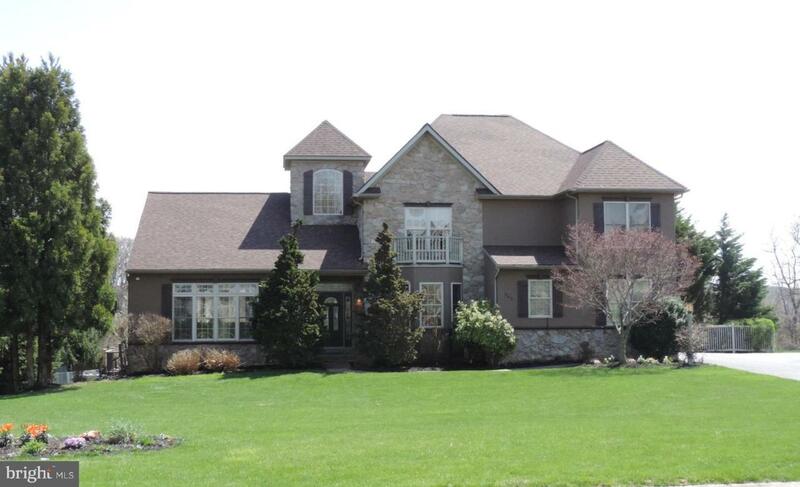 Spectacular 5073 square ft home located on 3/4 acres in popular Heritage Hills Golf Course Community and the Dallastown school district. Main floor can be entered via mud room that opens into hallway with very large laundry room and rain forest themed bathroom with a river rock floor. Spacious kitchen with granite countertops and new stainless steel appliances, including a versatile gas range. The very large kitchen island is ideal for family breakfasts or late night homework. Enjoy a cup of coffee in the custom built breakfast nook while overlooking the spectacular views of the backyard. Large and separate dining room and living room will lead you into an office with a magnificent custom built desk and built in book shelves with copious amounts of storage at every turn. Relax in the floor to ceiling glassed in sunroom that offers amazing views on both sunny days and starry nights. Access the upper level via a unique dual sided staircase. There you will find rich, mahogany hard wood floors and 4 bedrooms and 2 full bathrooms. The master bedroom is highlighted with tray ceilings and a contemporary gas fireplace to stay warm on even the coldest nights. The master bathroom features a luxury bathtub, a separate tiled shower and dual sinks. When it~s time to relax, wind yourself down the stairs to the stunning and one of a kind, fully walk out basement. Grab a wine glass from the mahogany bar cabinets and enjoy a drink at the large granite and custom tiled bar. Pull up a stool and watch a movie on the 120~ screen with surround sound that fills the entire room. Push on the bookcase and find a hidden room for your guests. When it~s time for some exercise, there is no better space than the separate fitness room that is outfitted with soft custom floors and full length mirrors. Imagine running on the treadmill and looking out the floor to ceiling windows at the beauty of the landscape and perfectly manicured backyard. There is no better entertaining space than the walkout basement that leads directly to the 22,000 gallon salt water pool. After a day of swimming, wind down at night with some smores around the fire pit. This is an absolutely amazing home with something to be loved by everyone of all ages! And if there is ever a worry about losing power, the whole house, natural gas generator will come on line in seconds, with barely an interruption in service.